The division between Eastern and Western medicine lies in basic fundamental differences. 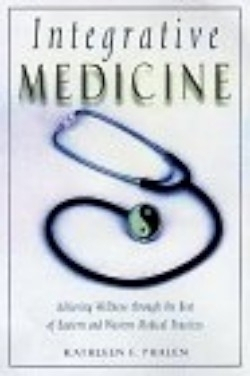 Eastern medicine is steeped in philosophy and spirituality, and sees the body as a microcosm of nature, while Western medicine views the body as a machine and bases diagnosis and treatment on cause and effect. Phalen makes a convincing argument that the integration of Eastern and Western medical practices can provide a solution to the ever-tightening noose of our managed care health system. Well researched and engagingly written, Phalen demonstrates this integration is already under way. She demystifies traditional Chinese practices of acupuncture, pulse diagnosis, meditation, healing diets, chi balancing, medicinal herbalism, and how to develop a healing relationship between doctor and patient. Next she contrasts East/West approaches to healing notoriously difficult-to-treat ailments such as allergies, chronic fatigue syndrome, AIDS, cancer, substance abuse and the life processes of childbirth, menopause and death. Finally she cites the work of those who are integrating both approaches into their healing practices and achieving results that satisfy both patient and doctor on a personal and spiritual level as well as a physical one. One can only hope after reading this book that the integration of the two approaches to healing will not be isolated to scattered practitioners and research centers, but will become more and more common — perhaps even found in our own neighborhoods.